You do not know true comfort in the workplace until you have experienced a heated office chair. Sitting for long hours can cause your body to strain and make you feel stiff. 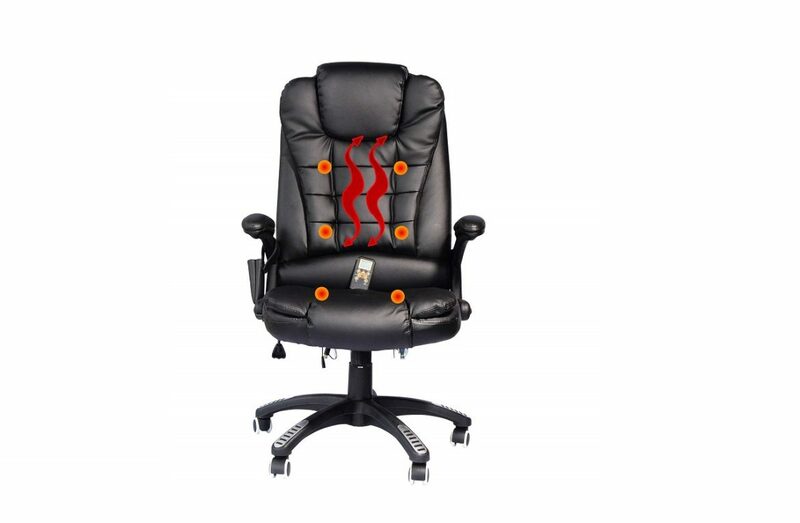 A heated office chair is not only good for keeping you warm during the colder months, but it also provides you with all the benefits of heat for your body. Heat soothes the body’s muscles, eases pain, helps with stress and aids in relaxation. 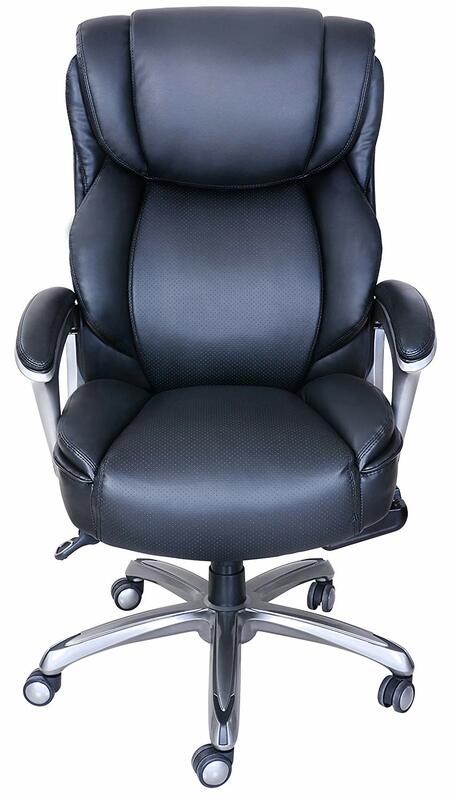 This executive ergonomic chair has received many positive reviews and happy customers. It will be your new best friend at the office. It is popular for its great 6-point massage function: from back support to increased leg circulation, your body will appreciate the care this chair provides. 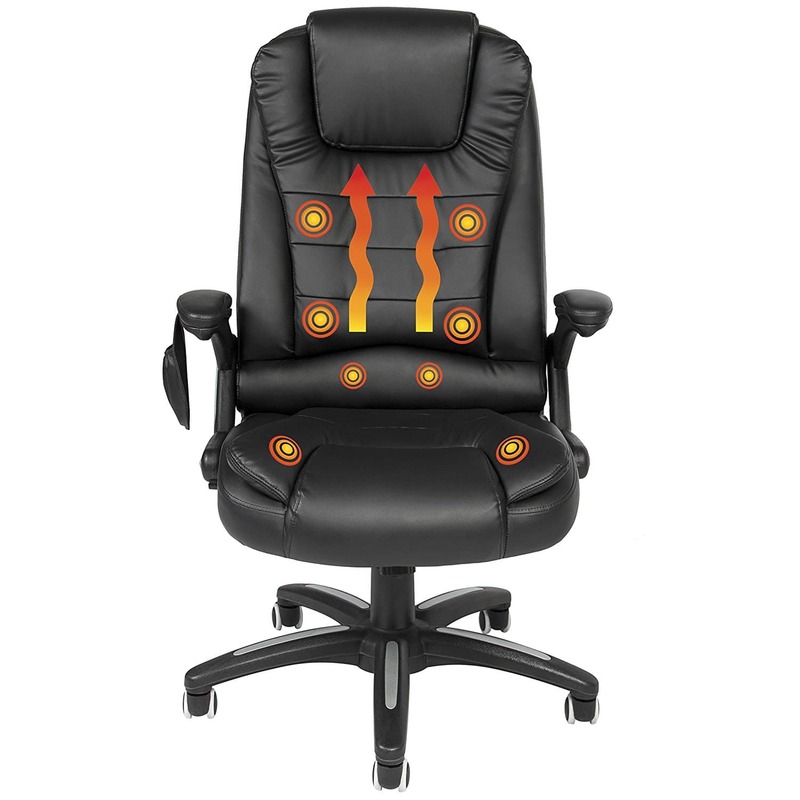 Heating Function – The heating function covers the seat and upper and lower back area. Massage Function – This chair offers 6 vibrative massage points to target your seat cushion and upper and lower back. This function is powered through a power cord. Quality Material – It is made from UP/UVC leather which is eco-friendly, durable and soft. This smooth material contributes to the extreme comfort of the padded armrests. Remote Operated – The chair comes with a remote control to easily adjust the massage and heating settings. Dimensions – This chair measures 26″W x 31″D x 43.3-47.2″H. Additional Features – It provides ease of movement as it includes a button to adjust the back position and a 360-degree swivel with the 5 durable casters. It also has multi-directional wheels and an adjustable height setting. This chair’s main feature is its ability to not only be heated but set to warm and cold temperatures to suit your needs and environment. Its high-quality thermal technology provides you with personalised temperature control for at home or at the office. Heating and Cooling Function – The heating and cooling system covers the back and seating cushion. It uses a 3D diffuser system located at the back of the chair and has an automatic shut-off sensor for safety and energy saving purposes. Additionally, a light will show to tell you that the heat/cool settings are active. Wireless Operator – This chair includes a rechargeable, high capacity Li-Ion battery. This type of battery is rechargeable and can withstand for up to 8 hours of continuous usage. Quality Material – Bonded leather and molded cushion foam. Adjustments – There are leavers at the side of the seat to allow for ease of height and tilt adjustments. Design – The impressive technology within this chair is combined with a stylish design. It is available in classic black. Get relaxed at the office in this vibrating chair to ease your muscles. It has everything: heat, massage and vibration functions that can easily be operated by a remote control. Experience a new level of comfort with a chair that fits all your needs. Moreover, it is not bulky and has a classic look. Heating Function – The heating setting can be turned on and set on a timer (maximum 20 minutes). 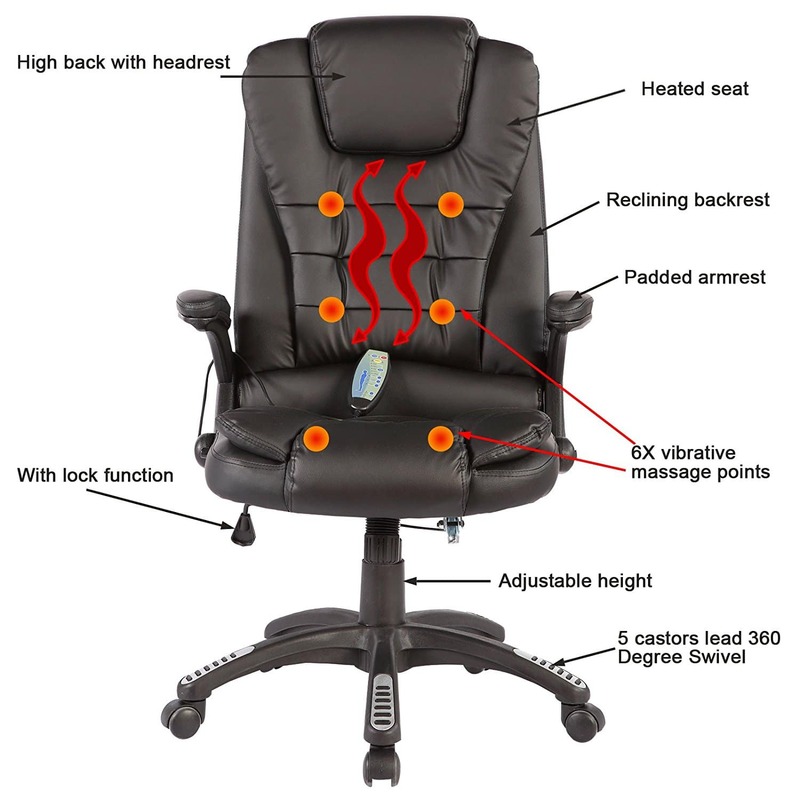 Massage Mode – This chair is programmed with 3 massage modes which adjust the intensity level. It targets 4 areas of the body: neck, upper back, lower back, and tighs. The areas can be targeted individually or all together: you decide. Adjustments– The backrest and seat height can both be adjusted to suit. Additional Features – The chair includes rolling wheels for ease of movement and the massage and heat functions are operated by a remote control. There is a pouch at the side of the chair for the remote to be kept for ease of use. Additionally, 2 AAA batteries are needed (not included). Material – It is made of faux leather. It has a classic look and the material allows for ease of cleaning. Chair Weight – 38.7 lbs. Weight Capacity – 285 lbs. Do you ever get into your car in the winter months and it is uncomfortably cold but you have no choice but to wait until the engine heats up and the heating begins to work? Or, during the summer months, do you ever enter your car to be hit with extreme heat? This seat cushion can solve both problems: it has 3 cooling levels and 2 heating levels. Enjoy it in your car or take it to the office. 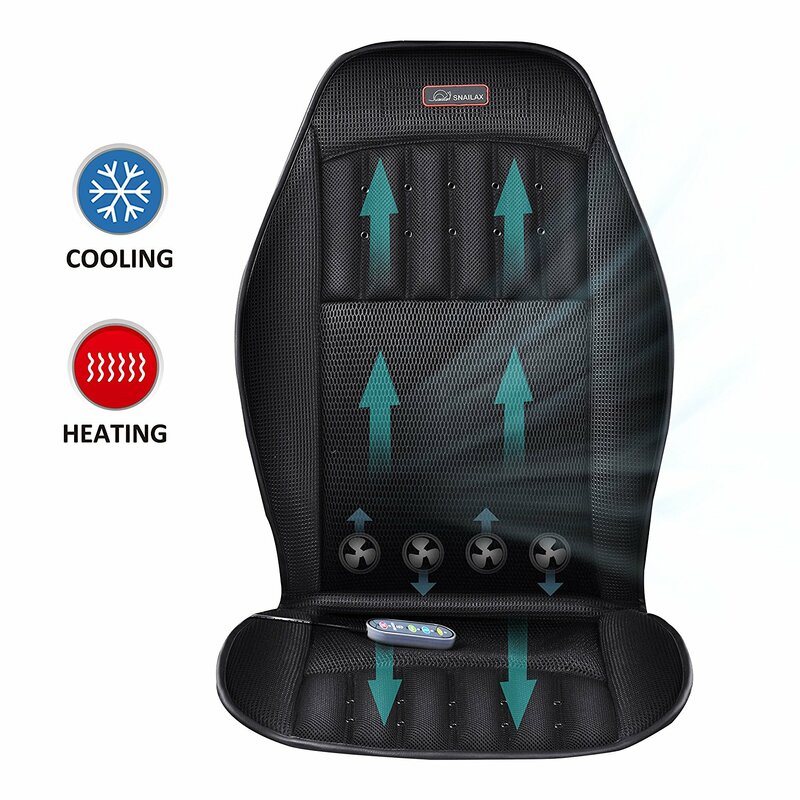 Adjustable Cooling Air Cushion – This cooling seat cushion has 4 intake car fans which distribute cool air throughout the cushion to cool body heat and absorb excess moisture. It will successfully prevent your thighs from sticking to the seat and will allow you to feel fresher while driving in hot weather. Adjustable Heating in Dual-Zone – The heated seat cushion is equipped with 2 heating pads: one at the seat and one at the back. It also has two heating levels. A heated seat during cold days will provide great soothing heat therapy. It is also equipped with overheat protection and remains at a stable temperature. Universal Fit – The size it made to suit standard vehicle seats and similar chairs. Ventilated 3D Mesh and 20 Air Vent Holes – This seat cushion is made from 3D spacer fabric which is known for its great support and ventilation function which prevents your body retaining heat from the seat, keeping you cool. The 20 air vent holes circulate cool air around the body, replacing the hot air. Non-Slip Bottom and Straps – This air-conditioned seat cover is designed with a non-slip rubber bottom and adjustable dual straps in order to secure it to the seat and keep it in place, whether its a car seat or an office chair. Additional Features – Included is a car adapter and home adapter. Return within 30 days for a full money back guarantee. Item weight – 4.25 lbs. The usual power supply via cable or battery when powering chair or a cushion will be 230V. Make sure the cord is long enough to connect to a power source near the chair or armchair. When purchasing a seat pad that is powered with battery, we would recommend you to invest a little more and look for a model with a lithium-ion battery. Such batteries have high performance and keep warm for several hours. For a heated office chair or armchair, you can rely on a heated seat support with 230V power supply, which is connected to the normal power supply. By the way, for hunting, fishing, a church or stadium visit heatable seat cushions are best. The cushions can be heated for several hours and are powered by a battery. In addition to the heating function, some seat cushions offer even more advanced functions such as different heating levels or even a massage function. Wether you go for a heated office chair or seat cushion, the health benefits are great. Additionally you will sit with never-before experienced comfort! If you found this guide useful, please feel free to share it on your social media!